"Prawns turn out lightly coated in a semi-crunchy, spicy, rich coating. These prawns melt in your mouth! Easy, very tasty and always a big hit. " Season the shrimp with 1/2 teaspoon each of garlic powder, salt, and pepper. Sprinkle shrimp with lemon juice, then roll in grated Parmesan, if using. Shake the remaining garlic powder, salt, and pepper together with flour in a plastic bag. Add seasoned shrimp to bag; close the bag and shake to coat shrimp. Heat oil in a large skillet over medium-high heat. Add shrimp and fry until golden and cooked through, about 2 minutes per side. Remove to paper towels to drain; serve hot. I tried this recipe and loved it. I like the crunchy taste to it. 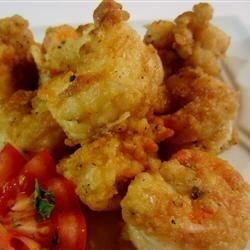 These shrimp were really good and very easy to make. I used 8-12 count shrimp and they were excellent paired with a steak for surf and turf. Thanks so much for posting the recipe. I used 3 tsp total of the salt and dipped in beaten eggs before shaking in flour mixture. Turned out awesome! Kids said it was like a dish from a restaurant, "How did you do that?!"